They were built to preserve the mummified bodies of great and powerful leaders, but long after they’ve taken the last breath, their pyramids have stood tall against the test of time. From Africa to Europe, these next seven pyramids prove that even death can produce some amazing sites. Once you’re in the presence of this ancient masterpiece, you too would believe the ancient legend that a dwarf with the help of his witch of a mother could magically construct it in a day. This is because the Pyramid of the Magician, also known as the House of the Dwarf, is an engineering feat that boasts five different levels of construction which was finally complete around 1000 AD. 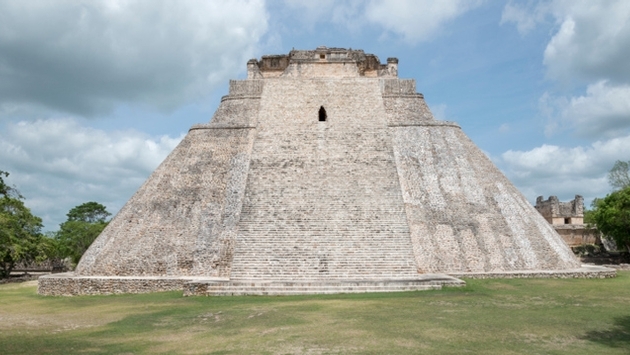 Towering in the Mexican city of Uxmal at about 115 feet, climbing the pyramid’s staircases not only blesses visitors with 360-degree views of the pre-Colombian site, but provides an opportunity to revel in the presence of the ancient Mayan culture. Although Uxmal is decorated with many ruins, The Pyramid of the Magician is arguably the city’s most daunting. Of course no visit to Egypt would be complete without exploring its sea of ancient pyramids. However, in order to give credit where credit is due, one must visit the pyramid that started it all. During Egypt’s third dynasty, King Djoser commissioned for a mastaba tomb to be built to preserve his dead body. By the end of his reign, the tomb that once displayed a flat roof transformed into the six-level Step Pyramid of Djoser, which measured around 200 feet. And what lies beneath the pyramids are labyrinths that stretch over three miles. Imhotep is recognized for creating Egypt’s first pyramid, and thanks to him the world can see the evolution of Egyptian architecture. Tikal is a city rich with archeological ruins left by the Maya civilization, but none of them speaks volumes like that of Tikal Temple I. The city’s most famous pyramid is also referred to as the Temple of the Great Jaguar because of its lintel, and with a height of nine stepped layers is one of the best architectural beauties of its time. Measuring over 150 feet, it preserved the body of an ancient ruler in a tomb nestled inside of the grand structure, and its constructional levels were also believed to be the layers of the underworld. But if you’re willing to take the steep climb onto this historic site you’ll witness the flow of power that once ruled the entire Guatemalan city. Even though the Red Pyramid is constantly overshadowed by the Giza Pyramids, it is still worth every bit of discovery. After all, it is the first of its kind to actually break away from the typical “step” appearance to become the first one to display smooth sides. Flaunting a pinkish color for the world to see, it is also one of the few pyramids that allow visitors to step inside and wander through its dark chambers. Even deep inside of its eerie tunnels there is a peacefulness that encompasses the tomb since it is not as popular as its other Egyptian cousins. But the Red Pyramid is one of the most adventurous, especially since you can get up close to its dynamic features. Even Rome was bit by the pyramid-building bug when the Romans created the Pyramid of Caius Cestius around 18 BC to 12 BC. Like many others of its time it served as a tomb for a wealthy magistrate, with rich white marble layered on its brick exterior. This spectacular site of Egyptian influence is the result of Rome’s conquest over Egypt centuries ago. As it shines in architectural splendor, you can’t help but notice that even the almighty Romans were swayed by the Egyptians’ charm. It was until 2005 that the thought of Bosnia cradling a pyramid seemed a bit ridiculous. That was until an array of them was discovered in the hills of Visoko, a quiet town in the country. One in particular is the Bosnian Pyramid of the Sun, which resembles the Egyptian version so much it instantaneously adopted the name. If this pyramid looks like it’s doing the twist that is because it actually is. The Bent Pyramid starts off at a 52 degree angle but works its way up at an angle of 43 degrees. Many theories about the pyramid’s drastic features have been circling through the air for ages; for one, it is believed to have changed its direction due to the lack of building materials. The other is because the blocks were becoming displaced, so a smaller angle would solve the problem. Regardless of why King Sneferu chose to create change the façade of this architectural gem, his decision has made the Bent Pyramid become of the most unique Egyptian pyramids of all time.